Over the last 25 years or so, a series of "World Congresses" has been held. These are very unique forum's as they bring together many very experienced Afghan Hound people from all over the world who share their knowledge and experience. In this section we have collected many of the congress reports and provide this index page as a way to find a topic of interest more quickly without having to work through the large collectrion of reports. Where we have as yet been unable to collect specific congress reports, we have at least been able to post a list of speakers and topics covered. I anybody can help in providing copies of, or links to missing articles, that would be much appreciated. 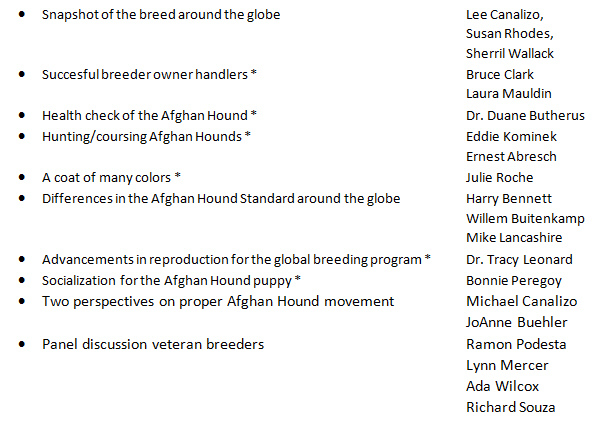 - "World Breed Extension Workshop"
- "The following presenters led a vibrant debate on various thought-provoking topics"
Lotte Jorgensen (Denmark) Why do we breed Afghans? Mary Pascoe (UK) How easy is it to make a champion? Paul Hewitt (Australia) Judging the Afghan Hound: why is it so difficult?